"I finally realize why they named the software Summit, because after you’ve finally mastered it, it feels like your standing on top of a mountain … in a good way! "My experience with Ritam Technologies' staff has been fantastic! The tech support I received from Noah on how to best utilize Summit Service Profit Builder program to my best advantage has been invaluable. "I am amazed at what this program can do. I can't tell you how much we appreciate all you have done." "I am so happy we found your software and that you could make it work for us." “I wanted to take a moment to tell you how much I appreciate the Summit Service Profit Builder software I purchased for our septic company. We recently got new computers and our old programs were not compatible to say the least. I talked to a few people before I finally found your company, and no one seemed to know what to do or how to do it. Also, they did not seem interested in helping really. How happy I was to talk to you. From the beginning you were extremely helpful. You asked a lot of questions and you got right down to business. You seemed extremely knowledgeable, and the fact that my old, dusty, and completely out of date system didn’t seem to scare you made me feel confident that I made the right choice. You helped me in 2 days with my program needs and converting and loading my old data. (I anticipated a long, terrible process.) And you did it remotely, which to me was rather impressive. To follow that, you set it all up because I was having trouble. And every time I called with a question, you patiently helped me get through any problem I had. I love my new software and have learned to bend it to my exact needs. 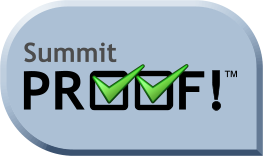 “We wanted to take this time to thank you for all your assistance to us in our conversion to Summit software. Your program has lived up to all our expectations, and we are very happy with its performance and the support we’ve received from you. The time and instructions you’ve supplied us has made a potentially difficult process very easy. “I would like to thank you for all the help and support you have given me in the past several months. When you sold us the program that was only the first step, I was amazed at how much time and patience you had walking me through each step of the installation process. And most important, being there whenever I needed help. Our next step to improve our company is to purchase the mapping and routing program. Whenever you are introduced to something new you always have mixed emotions, but I feel extremely confident knowing you will be there for me each step of the way. “Because of Summit we were able to switch to a 28-day billing cycle easily and that alone paid for our software purchase. Summit Rental Profit Builder™ is perfectly named, as all it has done is increase our profits. It has freed up 2 to 3 hours of my day and turned our end-of-month invoicing from drudgery, to a very simple process. Our customers really appreciate their invoices itemized and pro-rated so they rest easy, paying only what they need to. Customer checks are coming in sooner and more often with little or no calls complaining about mis-billing. Our pick-ups and deliveries are more efficient, and I absolutely love this program! It has made a huge difference in lowering stress in the company and increasing profits.